The Los Angeles Times pays tribute to David Bowie with a story about his advocacy for books and reading. 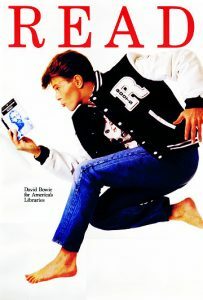 He was one of the first of a series of celebrities to feature on American Library Association posters aimed at promoting reading to children and young people. Here’s David Bowie’s list of 100 favourite books: how many do you have in common?